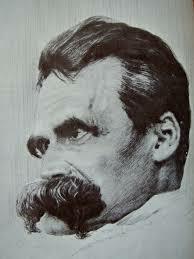 So it appears that Nietzsche may not have had syphilis after all! This article from the Telegraph suggests that Nietzsche’s symptoms – headaches, visual disturbances and his eventual collapse – were more consistent with brain cancer than with advanced syphilis. Really, it doesn’t make much difference from a philosophical point of view what he died from, but as this article points out, the claim that Nietzsche was syphilitic has been used as a kind of ad hominem attack against his ideas for a long time. Darren Ambrose begins Film, Nihilism and the Restoration of Belief with a recollection of his first viewing of Star Wars at age ten. He describes the transformative effect that the film had on him, “stretching his imagination” and changing him forever. It is clear that Star Wars was more than just a movie for him; to his young mind it was akin to a religious event, revealing something new and magical about the world. It was an experience that showed him, in his own words, “the reality of a world filled with transformative potential” (p. 3). It is just this sort of experience, Ambrose argues, that demonstrates the capacity of cinema at its best to overcome modern nihilism and to reenchant human life. I empathize with Ambrose’s experience, as I also recall, at approximately the same age, seeing Star Wars for the first time and feeling absolutely astounded by the spectacle. I remember thinking to myself that I didn’t want the movie to end, that I wanted the action and the space battles to go on forever. I had never seen anything quite like it before, and sitting there in the darkened movie theater I imagined that I had been transported to a new dimension of reality; one from which I did not want to return. The thing is, the movie did end, and though I went back to see it again and again on repeated occasions, I always knew that the illusion of Star Wars was just that: an imaginary fantasy that bore little resemblance to the world in which I actually did live. So, while I share Ambrose’s fond memories of this movie, I don’t share his faith in the long-term transformative potential that it possesses. No film has the power to overcome nihilism. In fact, I believe that film, as a medium, is nihilistic to its core. However, I also believe that this is not such a bad thing. The main line of argument that Ambrose pursues in Film, Nihilism and the Restoration of Belief starts with the premise that film is a “material form of thought” (p. 6). Drawing on theorists such as Andre Bazin, Stanley Cavell, Noël Caroll, David Bordwell and Gilles Deleuze, Ambrose characterizes the elements that are a part of cinema – such as photography and editing – as reflections of the human thinking process itself. Just as humans look a their world, attribute cause and effect relationships to the things they see and draw inferences from the evidence, so too in movies we find the construction of narratives that reflect the modes of thinking, the assumptions and the expectations of film makers. Movies that exemplify conventional, orthodox narratives, Ambrose claims, serve to reinforce our entrenchment in modern nihilism by repeating the same old “common sense” assumptions about the world that audiences find comfortable. However, there are filmmakers like Michael Haneke, David Lynch and Werner Herzog who, according to Ambrose, successfully resist conventional thought, producing films that instruct us in new and unanticipated ways of conceptualizing reality. By viewing these materialized exemplars of “counter-sense” thinking, audiences can participate in something profound and new, giving them the opportunity to break free from the stultifying and shallow world of nihilism. This opens the path toward a renewed optimism about the existence of “hidden truths” and the possibility for a “re-enchantment” of our world. Ambrose’s main conclusion is that this sort of cinema reinvigorates faith, giving audiences hope that the future does not necessarily have to be a rehash of past forms and patterns. Contrary to what Nietzsche claims, Ambrose believes that we are not doomed to an eternal return of the same. Just as I share Ambrose’s fond memories about seeing Star Wars for the first time, I also share his impatience with conventional movie-making and story lines. I am in complete agreement that film makers like the ones he admires should be applauded and appreciated for their bold and creative willingness to break with conventionality, to try something new and to offer unusual and interesting visions of our world. My own favorite film makers – George Romero, David Cronenberg, Lars Von Trier, Darren Aronofsky – likewise have created films that defy convention, that criticize standard patterns of thought and that offer new ways of being for our consideration. These are precisely the sorts of movies that I like to watch, and the older I get, the less time I have for boring, mainstream films that simply reiterate what has already been said. I, like Ambrose, want something new, exciting and challenging from the films I watch. However, unlike Ambrose, I’m not an optimist when it comes to the power of film to overcome nihilism. Nihilism, as I see it, is a permanent part of the human experience. It describes the situation that all humans find themselves in as they struggle and strive toward superlative goals. It is the condition of separation from our highest ideals. Perfection is lacking in our world, and though we wish things were different, it will never be so. But while nihilism creates a gap between the real and the ideal, this is a situation that is not unequivocally negative. It is both frustrating and hopeful, since it entails that while we must constantly fail to achieve our highest aspirations, we also always have more to do and work toward. This is the point that Nietzsche was getting at when he made the distinction between passive and active nihilism. The passive nihilist simply retreats from life and despairs. The active nihilist, on the contrary, vigorously – but vainly – struggles to fill the gap separating him from perfection. I see my favorite film makers as nihilists in the best sense: active nihilists who enrich our world with their creations. None of them have solved the problems of human existence, but they have nonetheless done something positive by engaging in the creation of art. The biggest flaw in Film, Nihilism and the Restoration of Belief is the author’s inadequate treatment of the key concept of nihilism itself. Ambrose never gives a satisfactory account of just what nihilism is, other than hastily equating it with “pessimism,” “despair,” “hopelessness,” and “scepticism.” In fact, nihilism is not simply the same as these negative, psychological responses. It is a much more complicated, multi-layered phenomenon involving human alienation and separation from superlative ideals. At points, Ambrose acknowledges that there is more than simply a psychological level to nihilism. But he never fully clarifies, defines or wrestles with the phenomenon. Consequently he falls into a pattern that is common to much of the literature on the subject, arguing that nihilism is self evidently bad, and that therefore it obviously needs to be overcome. This is a bit ironic in a book whose main message is that we need to open up of new ways of thinking. By giving such scant attention to the concept of nihilism, Ambrose passes over a number of potentially interesting ways that his own argument could be expanded and deepened. For instance, I found myself becoming quite intrigued by the ideas put forth in “Chapter One: Cinema, Realism and Naturalism.” It is here that the author discusses some influential theories of cinema, emphasizing the optimistic hope that film has the power to bring us into close contact with the objective world. This would be a perfect place to discuss the problem of nihilistic separation, going back to Immanuel Kant’s distinction between noumenal and the phenomenal realities; a distinction which provoked the very first accusations of nihilism from authors such as Heinrich von Kleist. Kant’s philosophy of Transcendental Idealism held that we never know the world as it is “in-itself,” but only through the mediation of interpretive categories of the mind. Because the mind always intervenes, we can only experience a world of subjective phenomena, while the objective world – the noumena – is forever outside of our grasp. If film was conceived as a way to bridge the gap between the objective and subjective worlds, then it may very well be a potential solution to Kant’s ontological nihilism. And yet, the question still remains as to how film could possibly accomplish this task. Doesn’t the camera itself (or perhaps the images produced by the camera) still intervene between our minds and the objective world, once again creating a nihilistic separation between the perceiver and the perceived? It seems to me that filmic representations must always stand apart from the “thing-in-itself” and are thus, by their very nature, unable to overcome the gap of nothingness that separates us from objective reality. Film is not powerful enough to overcome nihilistic separation, although it is powerful enough to offer interesting and creative interpretations of reality. And it can offer an infinite variety of these interpretations. I think that Ambrose appreciates this power, but he does not recognize that this is, in fact, an expression of nihilism itself. Film is nihilistic; but this is not necessarily a bad thing. If Ambrose devoted more attention to exploring the nature of nihilism, I have a feeling he might have come to the same conclusion. Despite an inadequate treatment of the central concept of nihilism, there is much that is useful in Ambrose’s book. His clear, concise discussion of film theory offers a nice overview of the field, and his analysis of the works of David Lynch and Werner Herzog is quite well done, offering some unique and thought provoking insights into the relationship between reality and representation. Additionally, I admire Ambrose’s clear writing and his ability to summarize and explain some very complicated theories. His book is worth reading for these features alone. 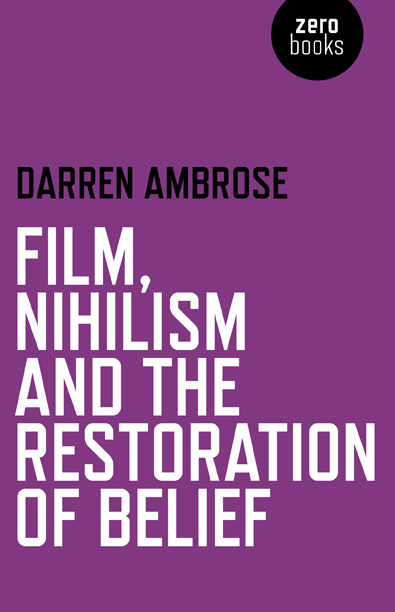 Ambrose, in the opening pages of Film, Nihilism and the Restoration of Belief, offers his childhood experience watching Star Wars as evidence that film is capable of producing a lasting transformation in a person’s being. My own experience tells me that such transformations are neither final nor that long lasting. What I do think films can offer is an ongoing and endless stream of interpretations and visions of reality, none of which are perfect or true, but all of which add to our understanding of what it means to be human in a world that constantly slips from our grasp.